Yes, You read it right. 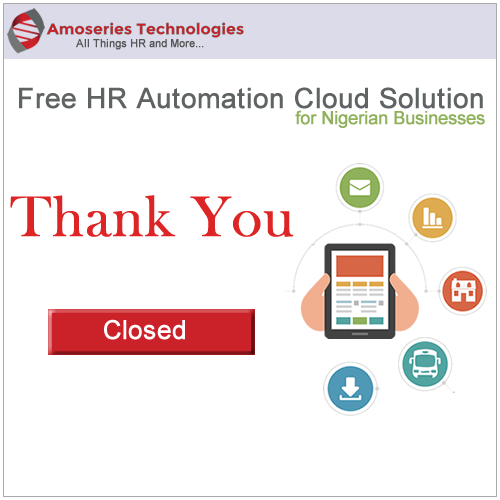 Amoseries Technologies in partnership with our HR Consulting partners is availing SMEs in Nigeria the opportunity to run and power their business processes using our award winning solution for 6 months free… and this offer window is open from the 17th April to the 19th of May 2017. We are offering a free business account to your organisation to manage HR and Administrative related processes for all your employees on the Cloud. This means you would be able to take advantage of our world class cloud solution to chart the course of your business processes to match those of Fortune 500 companies. To begin your free run of our award winning CSManager© HRMS solution, simply fill out the form to your left now and a customer service representative would get in contact with you. Interestingly, all businesses within Nigeria having 250 employees or less qualify for this. Your free evaluation would be active until December 2017 and in this period, you pay absolutely nothing for the service. What this means is that you can use every available module freely and without limitations. Our pricing is modular and SME / Enterprise friendly and you can simply click to generate just the right pricing for your business. Simply log into your administrative console, click on your name tag and from the list of options, a pricing calculator from within the CSManager HRMS application allows you better balance your cost as against the functionalities across module you require.For SME’s, there is also an available payment option from this screen and payment can be made using a Credit/Debit card online for ease or via a wire transfer. Yes You Can. Our support center offers basic support to our free users during their trial run period. Outside of that, customers are able to get a full help manual here or by visiting https://csmanager.com.ng/help or help videos on configuration and usage by visiting our YouTube channel. Sure. Simply click on the Share link above and select any of the available means to share this page with them and we would be more than happy to setup a free account for them immediately. Does my business qualify for this evaluation? Who qualifies for this? Or via the chat functionality at the bottom right of this page. I signed up my organisation for this service and since we signed up it’s been nice all the way. Now we can see and apply for our leave from anywhere anytime and have managers approve or give reasons for rejections without printing a single sheet. This trial is worth it evey bit of the way. Thanks guys.